Wisconsin’s weather has fluctuated the past two weeks. It nearly reached the 50s two weeks ago, before dropping a few inches of rain and then cascading below zero only a few days later. The massive swings in temperature pumped dirty water into the rivers and harbors and nearly compromised ice conditions prior to the Arctic blast that arrived last week and hung around through the weekend. This made fishing challenging beneath the ice. We flew into Milwaukee to film Pautzke Outdoors with Big Boy Fishing among various harbors from Kenosha, to Racine on north to Milwaukee, but had to scrap that plan as fewer than a foot of visibility was available through the ice. Fortunately, Plan B was still an option. We switched to pike. Pike fishing wasn’t off the hook as the barometer bounced and well below zero temperatures (with the wind chill) kept the pike from becoming too aggressive. In the three days we filmed action was sporadic for most. We noticed a few dozen anglers out each day and until late in the week most guys didn’t experience many tip ups. Prior to us visited Big Boy Fishing was fielding roughly two dozen tip ups a day. That number dove as temperatures fell near zero when we arrived. Still, we averaged roughly a fish per hour, which wasn’t bad considering the conditions. We fished live bait, exclusively. Not surprising, the Frabill aerators we used stopped working and we had to scramble to keep minnows alive as the water in the buckets froze within minutes of bringing them outside to bait lines. As poplar as ice fishing is this time of year live bait was tough to come by. Meanwhile, we did locate a few shops that were in stock and purchased several dozen live shiners. We didn’t use any natural colors rather Blue, Orange and Chartreuse live Fire Dye shiners. Keeping the bite alive (as mentioned above) was a chore as ice infiltrated our minnow buckets. The slow bite was revived by the vibrant shiners as you’ll see on our next episode of Pautzke Outdoors. When we looked through the hole the shiners literally glowed. We didn’t catch any huge pike (this is Southern Wisconsin not Minnesota) but caught and released a pile from 25-35 inches, all on Blue, Orange and Chartreuse Fire Dye shiners. Chartreuse was the hottest color, but some of the larger pike grabbed the orange. 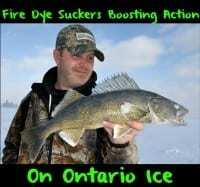 Kyle Deavers of Big Boy Fishing likes to run the live Fire Dye minnows a few ways. 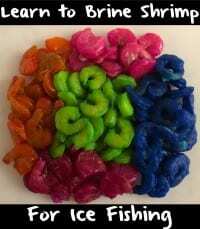 He’ll dye them in a small container for a day before transferring them to a larger bucket of water, but also likes to dye a few on the scene for about 30 minutes. Doing this, he says, brings another option for the pike: namely a minnow with it’s fins, tail and eyes dyed while the rest of the body keeps a natural color. Our largest fish was taken with this method. We had a few bass that grab baits through the ice, too. Only one, nevertheless, came through the hole. Fortunately, it was the largest fish, a near five-pounder that grabbed a Blue Fire Dye minnow. The bite is expected to improve as warmer weather settles in. Editor’s Note: Kyle Deavers operates Big Boy Fishing in Southern Wisconsin. For more info on his guided pike ice fishing trips please visit https://www.facebook.com/pages/Big-boy-fishing/235069236589269.